Hi to all the lovely reader of our blog! Wow ! !what a busy July is has been. 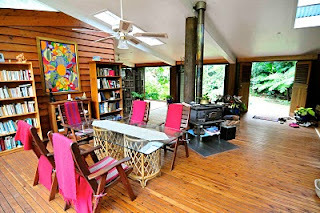 We enjoyed great and interesting guests, who all seemed to love their holiday up here in the Daintree and even though the weather was not 100%, but what is a little rain in this rainforest? 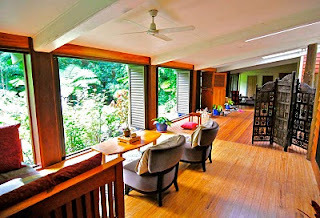 I attach a photo one of our guests took, who said the website photos are not as good as what he found. Thank you for the great photo and I hope it will show what it is like in our house. One problem having nice photos is: the house and gardens change all the time. Not just by myself rearranging furniture but also outside with bushes growing, flowering and new plants going in. Sitting on the back steps this morning chatting to a friend on the tablelands, a Kookabarra flew right over from the poinciana tree. sailed past my knee ! !, seem to hit the lower part of the mandarin tree, dropped to the ground and took off back to the poinciana tree. This is all flying less than 500mm off the ground! And what eye sight!!!. It was really good though to sit there with him sailing past ;I could have touched his wings. Well, that is it for now, very briefly. Have to plant all the vegetable seedlings, which did take despite the overcast weather.Looking forward to tomatoes, cucumber, melons and pumpkin, also bok choy and rocket. Have a great day, where ever you read this.